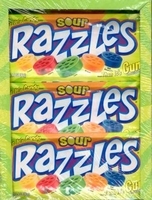 Sour razzles gum that starts out as candy once chewed turns into gum. You get 5 sour flavors Blue Raspberry, Cherry, Lemon, Lime, and Orange in each pack. Eat one piece at a time or mix them up and create your own sour flavors. Razzles gum is also available in regular juicy flavors and tropical too. Each box has 24 packages.